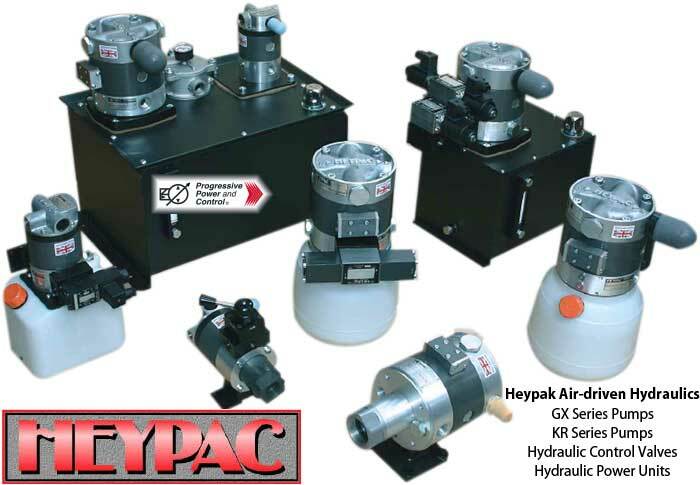 HeyPac air-operated hydraulic pumps, air-driven power units and zero leak hydraulic control valves. Progressive Power & Control sells air operated or air driven hydraulic components from HeyPac. HeyPac pumps are powered by compressed air applied to an air drive piston connected to a fluid piston by means of a piston rod. Power is intensified by the difference in the ratio between the diameter of the air drive piston and the diameter of the fluid piston. The GX Series is a 2 HP pump. It has a pressure range of 3 to 550 bar (50 to 8,000 psi) with flow rates up to 80 litres per min (21 gpm). The GX series includes a wide range of flow and pressure facilities and can be supplied in either basic pump form or complete with integral reservoir. With its range of complimentary accessories the GX series units combine economy and efficiency in a product suited for operation in the most demanding applications and stringent environmental conditions. The Heypac pump works on a reciprocating differential area piston principle. This means that the pump uses a large area air drive piston connected to a smaller area hydraulic piston to convert compressed air power to hydraulic power. The KR Series is a 1/2 HP pump. It has a pressure range of 3 to 690 bar (40 to 10,000 psi) with flow rates up to 10 litres per min (2 3/4 gpm) The KR series of air operated fluid pumps and hydraulic power packs is available in 5 models with fluid-to-air pressure ratios from 5 to 80:1 All models of Heypac KR air driven hydraulic pumps employ the same air drive with only the fluid end varying in size to produce the different pressure intensification ratios. Heypac poppet valves are self contained hydraulic control cartridge valve units mounted in a body with an industry standard ISO 4401 size 3 manifold mounting surface. All Heypac pumps are available in hydraulic power unit form complete with air filter, regulators, reservoirs and fluid filtration. Heypac offers a range of compressed air filter regulators for direct mounting on GX and KR series pumps. These filters include automatic drain, pressure gauge and fitting. Wall mounting brackets, shut-off valves and emergency dump valves are also available. Wire-supported 20 micron paper filter for use with manifold equipped GX20, GX30 and GX40 series pumps. For use with mineral oils and lubricating oils. Allow CETOP03/D03/NG6 standard valves to be mounted directly on to pumps. 10 liter and 30 liter reservoir kits available. Using a GX or KR series pump, the 10 litre reservoir kit contains all components needed to create a single pump, self-contained power pack, including tank and tank lid with filler breathe, pump mounting bracket, fluid level gauge, drain port, and extended pump suction tube. The 30 liter reservoir kit includes similar components but can be used with one or two pumps.